WATSONVILLE >> Each instance of homelessness and extreme poverty has its own hardships, its own flavor, its own twist. Those differences take on different hues even amid the distance from north to south Santa Cruz County, said the chairman of a local homeless services event. Project Homeless Connect, a one-day event showcasing local health and human service options, will branch out to Watsonville on Nov. 5 at the Watsonville Veterans Memorial Building for the first time since its 2010 Santa Cruz debut. The annual event is designed to help families and individuals accomplish, in one day and under one roof, what could normally take months, organizers said. Public and private individuals offer services ranging from legal advice and housing options to hygiene products and medical care. Organizers have wanted to expand to Watsonville since the beginning, event coordinator and Applied Survey Research Vice President Peter Connery said, but they did not have sufficient corporate and business financial backing or large-scale private donor support as with the Santa Cruz event. This year, the group decided to move forward to cover the approximately $15,000 price tag with reserves and in-kind donations from committee members and service providers, he said. "We are thrilled that Project Homeless Connect is coming to Watsonville. Our homeless community will have an easier access to services, especially those families experiencing homelessness," said Pajaro Valley Shelter Services Executive Director Kimberly Ferm, who also serves as a Project Homeless committee member. Hosting an event at a South County location will reduce transportation issues, avoid competing with the busy springtime planning season of Santa Cruz's Project Homeless Connect, and allow for services to be tailored to South County's predominantly Latino community, Connery said. In addition to making the county's most needy aware of local services, the Project Homeless Connect events serve as an education tool, Connery said. "This event enables the public and the community to see a broader spectrum of persons in the county and get a better sense of what they're experiencing, what they have experienced and how they can potentially link them with services that can get them a more stable living situation and hopefully a more stable health situation," said Connery. Such events also serve to highlight the high amount of local need versus the relatively low service availability, Connery said. A 2013 Santa Cruz County Homeless Census and Survey by Applied Survey Research counted 3,536 homeless individuals, of which 2,895 were unsheltered. Some homeless people have obtained some form of temporary lodging, from a garage or storage facility to a shelter or friend's couch. "It's been a tough thing to get off the ground down here. There has been very little fiscal support for it," Connery said of adding the Watsonville event. "We want to put a more human face on homelessness in South County — all over the county, but in South County as well — and get people to understand the diversity and complexities of it. We want to get people to understand that to be homeless doesn't mean to be a failure." 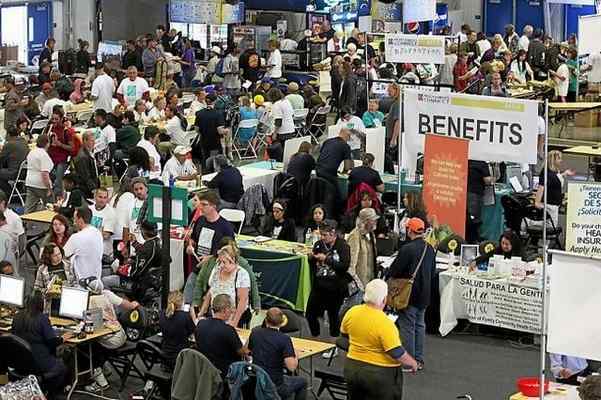 The Santa Cruz Project Homeless Connect drew 750 attendees to the Kaiser Permanente Arena in May. Connery said the Watsonville Veterans Memorial Building, donated for the event, is smaller though declined to guess how many attendees are expected next month. For more information, visit phc-santacruz.org or call 831-406-1742. What: A one-day event of health and human services for individuals and families experiencing homelessness. When: 10 a.m. to 4 p.m. Nov. 5. Where: Watsonville Veterans Memorial Building, 215 E. Beach St.